Free download SampleDecks Latest Version. SampleDecks 3 is an all-purpose sample player. With a few clicks you can allocate up to 64 channels with optional sounds in all current formats (e.g. MP3, AAC, WAV). You can play your samples either per mouse, per MIDI device or per keyboard. 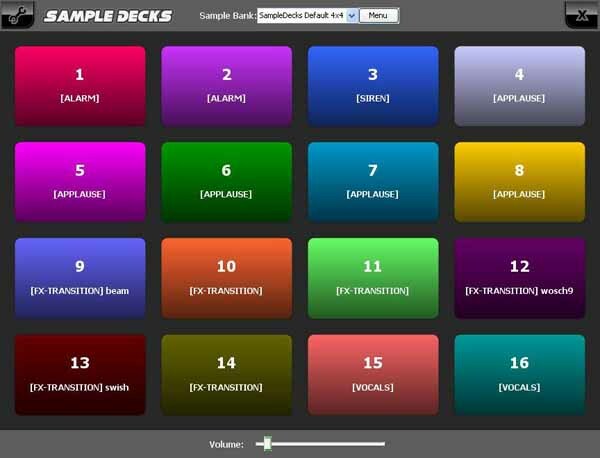 You can configure SampleDecks, like you need it – you can allocate the Sample-Slots with a name, a picture or a color. SampleDecks can be used as a big fullscreen application or as a small inconspicuous tool. The SampleDecks sample player can record up to 64 different sounds for your performance. With the wide range of colors you will always find the right sound. SampleDecks customises to you! Define the required number of the key yourself and you will never lose track! You can define the interface freely, so that you can customize SampleDecks to your interface like you need it right now. With the new MIDI learn mode you can play all samples with your own, familar MIDI controller.With the new MIDI learn mode you can play all samples with your own, familar MIDI controller. Thanks to the function “global hotkeys” your shortcuts always work, even if SampleDecks is minimized! So you also can control SampleDecks, if you are working with another program. You already own UltraMixer? But SampleDecks appeals to you? No problem, because you can combine both without problems and set everything up like it pleases you! So you get more samples and you can choose, which you want in the foreground.